Besides music- and movie-making Michel Montecrossa also is an outstanding poet and writer, documented in the publication of his ‘Song Lyrics #1′ and ‘Song Lyrics #2′ presenting 1750 of his song poems and the publication of his fantasy action novel ‘Tarana And The Island Of Immortality’ and many other important releases. When Michel Montecrossa is not in the studio working on new productions he is on the road together with his band ‘The Chosen Few’ and his ‘Lightsound Orchestra’ (Mirakali, Diana Antara, Mirachandra, David Butterfield) presenting through his live-concerts a Cyber-Rock & Symphony Vision come true. Michel Montecrossa and his musicians are living in Mirapuri-Coiromonte, Italy. Their music is a continually evolving message, a Cyber-Music dream come true. Every month they perform live at the Music-Hall of the Omnidiet Resort and Business Hotel in Mirapuri as well as at the Michel Montecrossa Rock Vision Diner in Gauting near Munich, Germany and other places. They lead a life of friendship and experience, artistically expressing the impact of life and future possibilities. Michel Montecrossa and his musicians continuously create new songs and instrumentals, new lyrics, new styles of performance. Every concert is a new Cyber-Music Journey. It is fascinating to experience them and get the feeling of Cyber-Music which is not isolated in an alien world but part of a consciousness-expanding outlook on things and a practical way of life being more than an alternative to present conformity. Michel Montecrossa 1993 started the Spirit of Woodstock Festival which since then takes place every year in July / August for ten exciting days in Mirapuri-Coiromonte in the North-Italian Mountains. The Spirit of Woodstock Festival in Mirapuri is the leading Festival of the Free-Music-Revolution and is combined with the hearty feastin’ and drinkin’ flavour of Mirapuri’s one and only Original Bavarian Oktoberfest in Italy as well as the love Flowerpower-Happening of the Mirapuri Rainbow Gathering. The Spirit of Woodstock Festival in Mirapuri offers to visitors and participants great multicultural entertainment with international flair and an inimitable atmosphere of Love and Joy. During the ten days of the Spirit of Woodstock Festival Michel Montecrossa, his band The Chosen Few and his Lightsound Orchestra sing and play along with international guest-bands for a happy and enthusiastic audience. 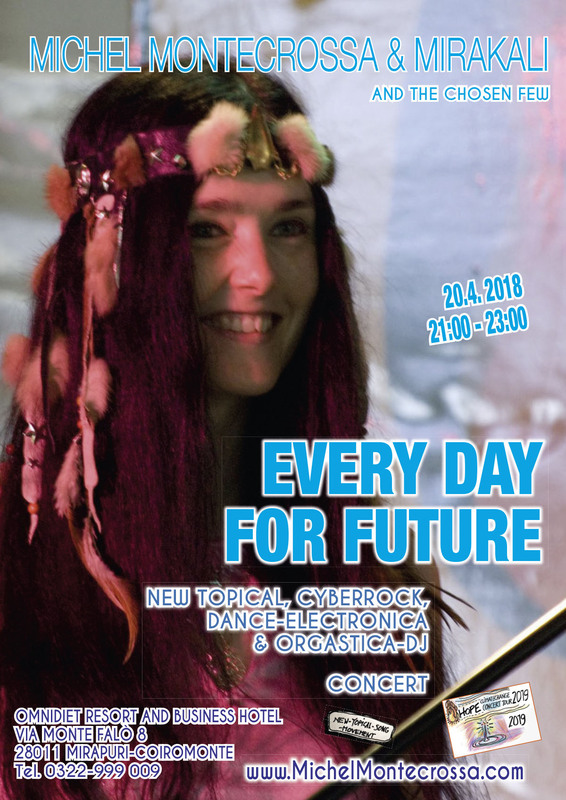 Michel Montecrossa and his musicians also play at other Mirapuri Festivals dedicating their songs and symphonies to the cause of a better tomorrow. They bring great 21st Century Cyberrock, Metal, Dancedrive, Cybersymphonies and Poetic Songs of Peace, Power, Love and Happiness to the stage. Michel Montecrossa sings with his golden voice of rich emotion, sensual power and global commitment. Michel Montecrossa is high-class musical drive: electrifying, charming and warm, embracing the audience with the energy of his personality and his outstanding Guitar-Electronica Rock-Metal-Dance and Acoustic performances as well as his Cybersymphonic flair. He is great message and joy for every audience and a good time with sensual dancedrive, meditative and poetic meaning: positive and young, givin’ everyone an experience to remember and to love. Michel Montecrossa concerts are great celebrations of happy power, drive, emotion and contemplation for an audience enjoying the magic of rhythm, love, peace and a stunning variety of musical styles makin’ everyone feel better. He comes with the heart of a freedomloving man easily bridging the vast reaches from High-Energy Cyberrock-Metal to Acoustic-Poetic Ballads and Cybersymphonies. Michel Montecrossa is an outstanding 21st century voice and musician: encouraging, full of life with great songs, instrumentals and sounds that tell of peace, power, love and happiness in concerts you won’t forget.